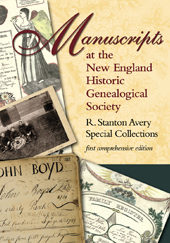 Among the holdings of the New England Historic Genealogical Society is an extensive collection of manuscripts dedicated to genealogical and local history material. Filling more than 5,000 feet of shelving and containing over 28 million individual items (some of which date back to the fourteenth century), this collection, known as the R. Stanton Avery Special Collections, offers members an incredible repository of information. Title, in boldface: Mss 1033 Adams, John Quincy, 1767–1848. Five page handwritten letter in which Adams responds an inquiry by Rev. William Buell Sprague for the genealogy of John Adams (1735–1826) from the time of the arrival of his ancestors in this country. Genealogy begins with a brief description of the settlement of Braintree (now Quincy). A postscript explains the relationship of patriot Samuel Adams. Guides are available for many of the larger collections. (The catalog record will note if there is a guide for a collection.) Each guide contains a general overview of the collection, a short history or biography of the collection’s creator/compiler, an overview of the collection’s contents, and a listing of the contents of each folder. NEHGS is currently working to add digital copies of these guides to the NEHGS Library Catalog Database (accessible via a link in the catalog record for the collection). You can also access the guides through the NEHGS Digital Library / Archive. All manuscript material is housed in closed stacks. Patrons may access materials by completing a manuscript request form (available at the fifth floor reference desk) to facilitate retrieval from the stacks and to establish responsibility for use. Patrons should note that unprocessed or partially processed collections may not be immediately available. Adapted from the foreword to Manuscripts at the New England Historic Genealogical Society: R. Stanton Avery Special Collections (2011).